We talk frequently in Libraries Deliver: Ambition about ensuring library service design and delivery is informed by evidence and data. One key source of evidence is from research, and that’s why we have Action 4 in the Ambition Action Plan. It describes how we will identify and commission further research work to be used as a shared evidence base by all. To start this process, it was important to establish what research had already been done, is ongoing, or is planned to take place soon. Through some (albeit limited) crowd-sourcing and a few workshops, we have come up with this spreadsheet (see the ‘Instructions’ sheet first for guidance on the definitions used in compiling the information). We’ve also added some information on the changing policy landscape in England by way of context. Many thanks to everyone who has contributed so far. We know the document is by no means comprehensive, but it is a good ‘starter for 10’ on local, national and international research relevant to our sector. We are keen to fill in the gaps on the research shown, plus add in any other relevant research that you are aware of. If you have something to add or think something needs amending, please use this form to provide us with the information or email us at librariestaskforce@culture.gov.uk and we’ll update the spreadsheet accordingly. We are also considering what the best format is for making this information publicly available. For now, we have made it available as an excel spreadsheet, but we are exploring other options. If you have any ideas, please email us. As part of this exercise, we’ve also been asking people what further research they think would add value. We’ve had a very long list, so we’ve also been asking them what criteria we should use to prioritise future research ideas. The suggestions for prioritisation criteria so far can be seen in this survey where you can vote for your preferences or make other suggestions. In the same survey, we’ve included all the suggestions for future research received to date - again, you can vote for your preferences or add other suggestions. The survey will be open until 2 May 2017. 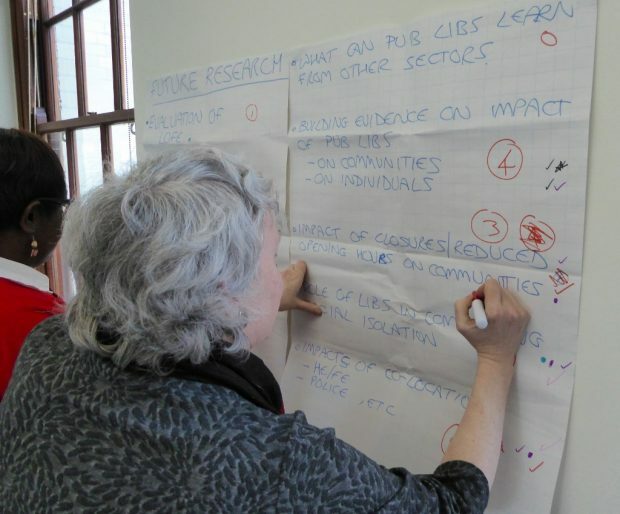 After this, we’ll collate all the responses, discuss them with the full Libraries Taskforce, and develop an agreed list of future research priorities which we’ll publish. We’ll then use this list in negotiations with potential funders. We’ve had lots of suggestions about organisations and individuals who we should approach, but if you have any other ideas, there’s space at the end of the survey to include them. What has also come out of our discussions across the sector is that, whilst research being undertaken is very valuable, it is only of use if people know about it. All too often during our workshops, someone would mention an interesting piece of research and there would be blank faces around the rest of the table. Therefore, we are also looking at ways of making existing and new research more visible to everyone working in the sector or with an interest in it. Our first step is to make the collated research document we’ve developed during this exercise available (link above). However, we recognise we aren’t the first people to face this problem, so we’re also talking to people in other sectors about approaches they’ve tried to see what might work best. If you have any thoughts on this or have any problems with the survey, please email us. To keep up to date with our activities, either subscribe to this blog, or follow us on twitter.